I got a tip from a taco informant about some taco activity in West LA. The suspects name was Pili. Apparently this Pili was grilling up some authentic tacos on the westside. I think that’s actually a misdemeanor. Section code c1300-200. I salute Pili’s for their boldness. They set up shop across the street from La Salsa,one of Southern California’s fresh mexican grill chains. La Salsa’s motto is “keep life fresh, keep it exciting” I have no frickin idea what that means. I got a closer look inside Pili’s: A few tables, a counter with stools, a cooler with bottled soft drinks. I wasn’t too hungry so I ordered a carne asada taco and a carnitas taco to go. I tore into the beef first after plucking out a few fatty bits. The greasy carne asada really hit the spot, the salsa roja was not real spicy but had good flavor to it. The tortillas were damp but I expected as much when I decided to get my tacos to go.Foil will make your corn tortillas sweat and they can get a little soggy. The carnitas was soft ,juicy and well seasoned. Not too porky and no stray bits of fat to ruin the experience. 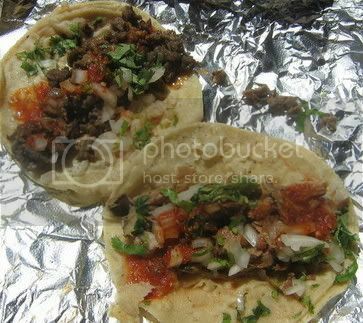 Overall these were quality tacos that demand a second trip to try the al pastor and barbacoa and other antojitos. 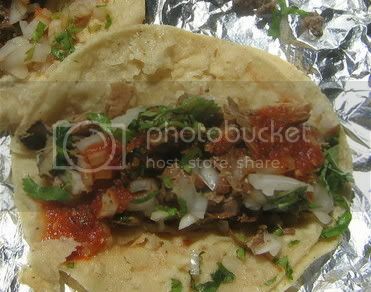 I'm a big fan of barbacoa, which seems to be underrepresented in a lot of taco shops. Looking forward to more barbacoa reports! obviously i love tacos, i am a L.A. area local and plan on visiting regularly. I went for lunch, very good carnitas and al pastor taco. The tacos are $1.25 each. I tried this place on Monday night. I had told myself to avoid the superbland Benito's tacos and found this place. At about 1 am, there were 3 other patrons. I ordered the carne asada burrito - nothing special. The meat had flavor but it was chopped into oblivion so I didn't get that 'bite'. What i wanna try next time is their 'clayuda' - a giant, pizza-sized tostada w/ carne asada, lettuce, salsa and sour cream. The 3 other patrons each had one of their own. I love Pili's, though recently I've had some mixed experiences there when it comes to the tacos. West LA has its spots, though, my favorite is Juquila, and their truck is even better. El Paladar Oaxanero is the bomb. Monte Alban, Lares, La Flama, a few more come to mind...people sleep on west la when it comes to mexican food, but its called the Oaxacan corridor and has a wealth of Mexican restaurants. A sublime soup with tender pieces of goat, cooked for many hours, tender, savory, subtle. What I've been looking for in Mexican food (or any other) for a long time. Highly recommended. 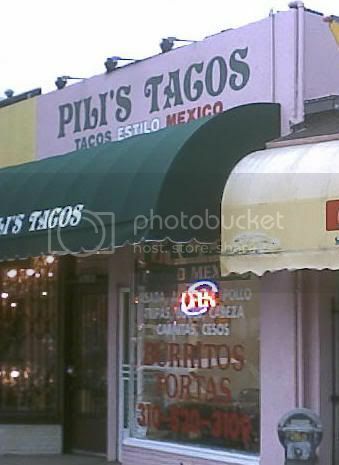 I am a big fan of the Pili's Tacos, it is just like the taco shops i find down in Ol'Mexico. We live quite close so we like to frequent Pili's for a quick bite. Dont forget the 3.50 Tortas, Umm Umm Good. I was at Super Taco last night- (second time in one day) and decided to give Pili's a try. The shop was empty at 7 PM, usually a bad sign for a restaurant. I ordered 1 carne asada, 1 carnitas, and 1 al pastor. I wathced the tacos being prepared, and was disappointed. The tortillas went straight from the bag to the foil. No oil, no preheating on the grill. The a.p. was mediocre. It was overcooked and crunchy--- as if in the oven all day and all the leftover scraps. Extra roja did not help. The asada and carnitas were not much better. Since I had a bag of tacos from Super Taco, I did a side by side comparison. The meat from ST was tasty and tender, tortillas were fluffy and warm, and the assortment of sauces from the open salsa bar were great. Pili's needs more discipline quality control. The 3 taco rating is generous--2 tacos would be more accurate. This place is not very good. It's a shame El Super Taco closed because I'd go there over Pili's any day of the week. 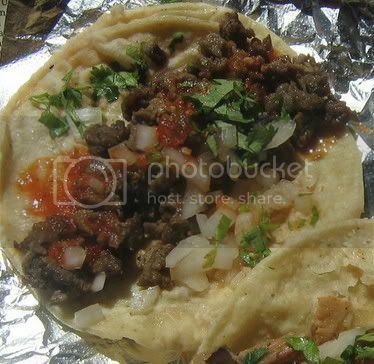 I also prefer Taco Plus on Bundy -- much better carne asada and al pastor.